Friday 18th November 2016 - a windy, cloudy and cold day! Well, what a night! The wind rocked us and the rain 'serenaded' us - so all in all, it was quite difficult to sleep - but at 7am it felt like we were under a waterfall - such was the torrent that descended onto our roof! And then - all went quiet and we finally went into a sound deep sleep, but only to be woken a short while later by our alarm that went off at 8am! 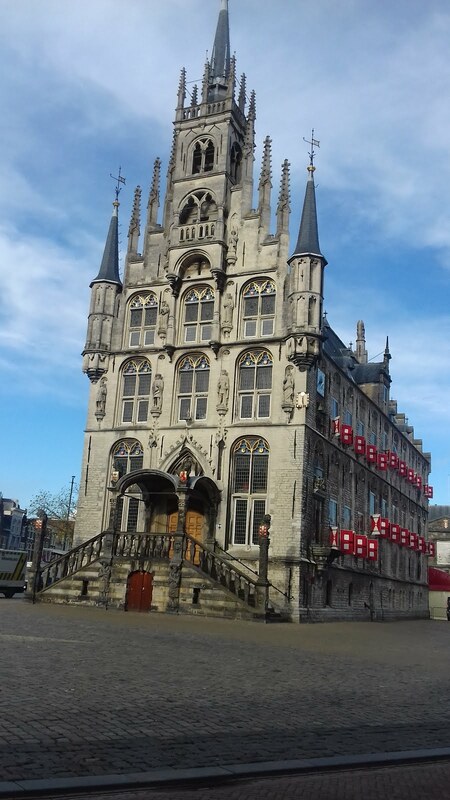 Once we were up we got sorted and moved on to the town of Gouda - which wasn't quite what I expected. In my minds eye I'd pictured quite quaint streets that were lined with cheese shops and other usual tourist paraphernalia. What we actually found was a busy city with numerous canals criss crossing it, and streets that were thronged with the usual huge number of cyclists and people going about their business. And to get to the Stellplatz John had to negotiate said narrow streets which he did with his usual aplomb, so it didn't take long before we were parked up on a Stellplatz that was at the side of a car park but which provided all the facilities we need for the princely sum of 8 euros. John off trying it out! 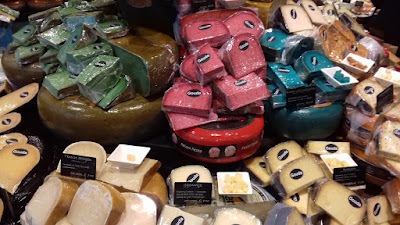 Some of them reminded me of soap in the 'Lush' shop! Now, our purpose for coming to Gouda was to buy cheese, (we're both cheese monsters) so once we'd had our typically British lunch of beans on toast, we set off to find a cheese shop - which turned out to be a bit like looking for hens teeth in the town of Gouda! In the end we found 2 - a real one, and one that seemed to cater more for the tourist market. So after a though tour of the area we settled on the former and were hugely delighted with the products that we brought - even if they were a little expensive. We made our choices after an extensive tasting experience, and out of the many we could have chosen we settled for 3 different authentic cheeses that we were sure were going to delight our taste buds later. And this was because the shop is apparently the only one in Holland that sells exclusive Gouda farmer's traditional cheese which is made from unpasteurised milk to enhance it's flavour. While we were in the shop we also learnt that the cheese is made in limited batches so it isn't exported, and additionally, it is quite unique in the range of flavours available. 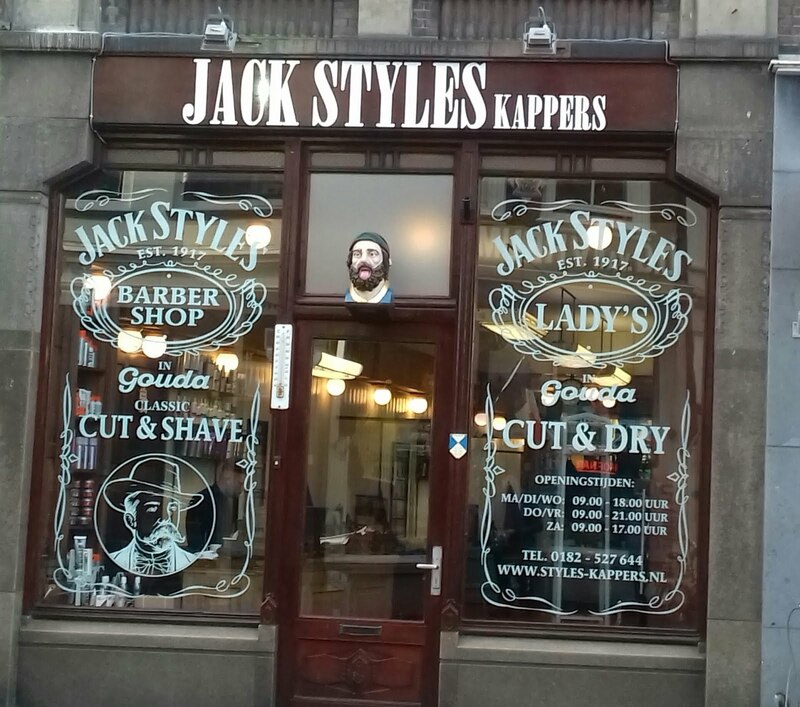 www.kaaswinkeltje.com. Once our purchases had been made we hurried back to T4rdis2 where we indulged in our very own exclusive cheese and wine party - I think maybe I forgot to mention we'd also purchased aged ruby port and posh crackers to go with the main act! Saturday 19th November 2016 - A windy but warm and sunny day! Our first priority today was to find a hidey hole to shelter from Storm Angus which we knew was heading our way and bringing with it high winds and lots of rain - but more no that later. Our other priority was obtaining supplies 🍔- we'd already tried to visit a couple of supermarkets but without success due to being unable to get anywhere near with T4rdis2. Our first attempt had been on Thursday at Katwijk, but the Lidl there only had on street parking, and even to access that we would have had to negotiate several very tight streets. Next we tried another Lidl while we were in Gouda, but that was worse - they only had parking on the roof 😒! So today, we either had to get some food or eat cheese and biscuits all weekend, so although that wouldn't have been a bad fate, John got out his maps and highlight 3 places where he thought we would be OK.
We set Tommy Sat Nav for the first one at Barendrecht, and although there was plenty of parking all around it, it turned out to be a big NO NO because it's entrance was guarded by a height barrier. But not to worry, we still had 2 other options in reserve - but this was where we came unstuck good and proper! Tommy was now guiding us into the heavily industrial south side of Rotterdam where the very complex road system of the A15/16 can be found -😨 in places there are at least 16 lanes, many of which are new and therefore not in Tommy's memory. This, along with one inaccessible road that Tommy was insisting we use resulted in us travelling in circles, and in the end it felt like we were in a vortex from which we were never going to escape. However, eventually my excellent and trusty driver did manage to extract us, but as soon as we could find a parking place he did need coffee and cake to help him recover - and I wont tell you about the few four letter words that had blued the air as we went😠! And we still had no food! So out came the maps again and another location at Brielle was programmed in, and once again we found ourselves traversing very narrow residential streets, and when we got there - still no room to park! 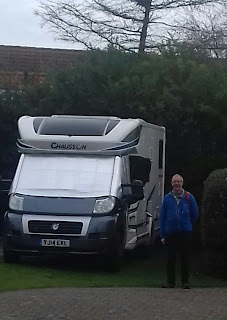 However, by now we were a bit desperate so we left T4rdis2 on a side street and just dashed in to get essentials to see us over the weekend, then proceeded with our journey to a campsite on the coast at Zeeland where we plan to stay for the next 3 nights. Sunday 20th November 2016 - Very high winds and lots of rain courtesy of Storm Angus. You wouldn't really believe that 2 days could be so different. When we arrived here yesterday afternoon we'd had sunshine streaming through our windscreen and been able to sit with the door open while we ate our late lunch🌞. But then as evening drew in it got quite cold and the wind started to rattle around, but still not causing us any worries in our sheltered little spot. John had been watching the weather forecast closely and it seemed to be telling us that the worst of the storm wouldn't reach us until early this morning, and that really is just what happened. We woke about 6am to find the van occasionally shuddering and rain pattering on the roof, but it still didn't seem too bad, however by lunch time the shudders had turned to jolts and at one point the wind tried hard to steal our silver screens form our windscreen. Therefore, we spent the day in the safe confines of T4rdis2🌀🌊⛈🌀 hiding from what seemed to be a cyclone! We passed our time with our usual electronic gadgets using the campsites free wifi and File Factory to download things that we'd missed on TV while we've been away. Then later we treated ourselves to a home cooked roast beef Sunday dinner and watched Blackpool Strictly! This morning the weather was still grim 🌁so the grand exploration of this area got postponed until we come back next spring. However, after being in the van all day yesterday we did feel the need to stretch our legs, so at around 11am, when the rain seemed to have stopped (it didn't last), we donned our coats and went for a walk on the beautiful white sand beach🌊⛱. In all we were out for a couple of hours, but other than a short dry spell while we ate our lunch, the showers kept coming, so in the end we went home and did a little more research into our pending purchase off new E-bikes, hopefully soon after we get back to Blighty - Oh, and of course we watched the 'Strictly Results'! Tuesday 22nd November 2016 - Bright and sunny, but still very windy. This morning we're heading for an Aire in France that is near the ferry port at Dunkirk from where our ferry⛴ home is booked for mid-day tomorrow. Our journey was about 130 miles - we left Zeeland at about 11am, zoomed through Belgium with just a quick stop off to do a bit of last minute European shopping🛍, and arrived in France at the respectable time of 3.30pm. And now all we have to do is wait - after 5 months away we are very much looking forward to setting foot on home soil. However, even when we do we wont be quite home - we plan to spend another week or so in the Southern part of the country visiting several ⌁🚲shops that seem to be clustered in that region . Wednesday 23rd November 2016 - Pouring rain Again! Today was the final day of our European tour, that has seen us stay for prolong visits or fleetingly pass through 7 countries which include France, Germany, Czech Republic, Austria, Poland, Netherlands and Belgium, and in doing so we have travelled 5,334 miles. Have we enjoyed it? Mostly yes! T4rdis2's performance - we mostly managed more than 30 miles/gallon, and apart from on little scrape, no mishaps! Missing our family and friends, and at times being a bit homesick. The 'bugs' which sometimes invaded when John left the fly screens open! Very occasionally getting on each others nerves in a confined space! Are we going to continue with this lifestyle? Today our journey was boringly simple. We boarded the ferry on time and our crossing was 'wave' free, so other than the rain we've got nothing to complain about. 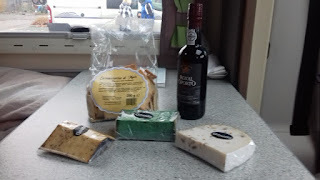 On arrival at Dover we nipped into the local 'Tesco' and acted like children in a sweet shop - chucking all sorts of goodies (that we've deprived of over the last 5 months) into our trolley. 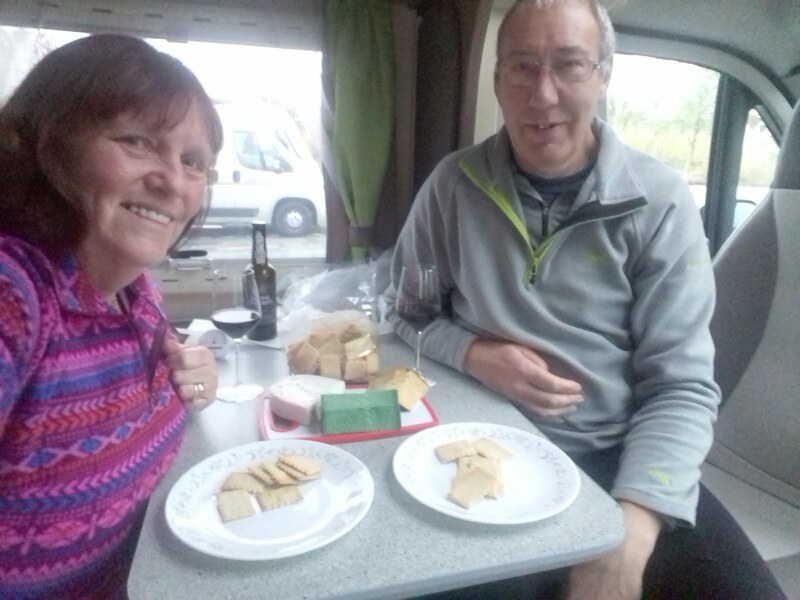 This included items such as tomato soup, proper bacon and of course a drop of decent cider which we are now sipping while relaxing at the Canterbury Camping and Caravan Club site. Tomorrow we plan to do a little exploring around and about, and as I've already mentioned, we've also got a couple of stops booked to look for our bikes, and then after that we'll be heading home to see our family - we can't wait.